Yellow drives a 3 ball break. 25+ under the tent! 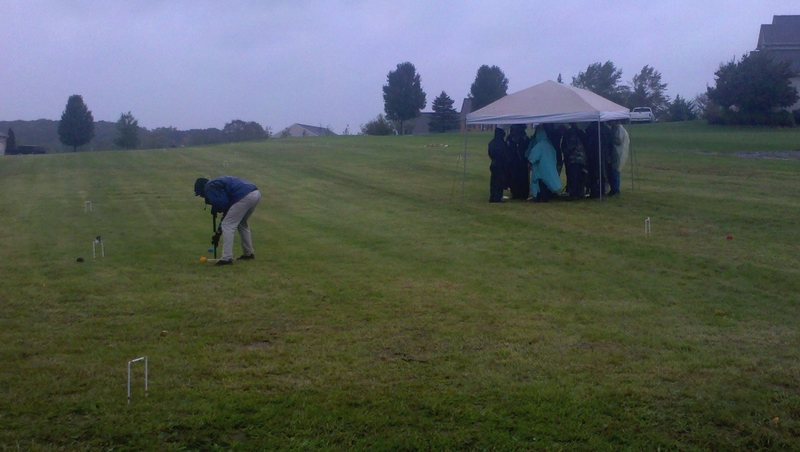 The Capitol Croquet Club Fall Classic Open Tournament was held over the week-end of October 1, 2011. Dave and Brenda had the croquet field cut, trimmed and raked… a major accomplishment given all the rain we’ve had. Thank you Dave and Brenda for all your efforts and for, once again, hosting the Fall Classic. Saturday wasn’t terribly cold, however it did rain, off and on, all day. But even with the weather challenges we faced, we still had 27 players and around 40 attendees all together. Not bad for a rainy day! We set up three courses so everyone could play three games. Once we tallied the scores (one point for each wicket made), the top six players advanced to the Final. The Final, however, was called due to heavy amounts of rain coming down in sheets and creating quite a soggy mess. Therefore, trophies were awarded to the Finalists based on their cumulative score from the three earlier rounds. And, for the first time (that I can remember) we had a tie for Second place. Both Steve Shultz and Brad Donaldson had the same total score and received Second place Glass (Brad was not present for the awards ceremony as he and Mary were called away on urgent family matters – his trophy’s in the mail). Tony Wackerle, to whom we owe a huge thank you for bringing the grill and cooking burgers for us all, took third place. But it was Roy Morgan who was the man of the hour! He followed in his sons foot-prints by winning every round he played and scored a perfect 51 points (just as Steven did last year at the Classic!). Well done, guys. So, that’s it for now. I’ll send more info on the Tournament of Roses later.